The park is located in the stunning Kimberley region in the northern part of Western Australia and can be accessed via the Fairfield-Leopold Downs Road which also passes through Windjana Gorge National Park. The Fairfield-Leopold Downs Road is connected in the north with the Gibb River Road and in the south with the Great Northern Highway. The distance to Derby in the north is 180 km (112.5 miles) and to the south, the distance to Fitzroy Crossing is 112 km (70 miles). Tunnel Creek National is based a bit more than 30 km (18.8 miles) to the south of the magnificent Windjana Gorge National Park which you don’t want to miss out on either. So if you are exploring the area, you should definitely make time to visit both parks. 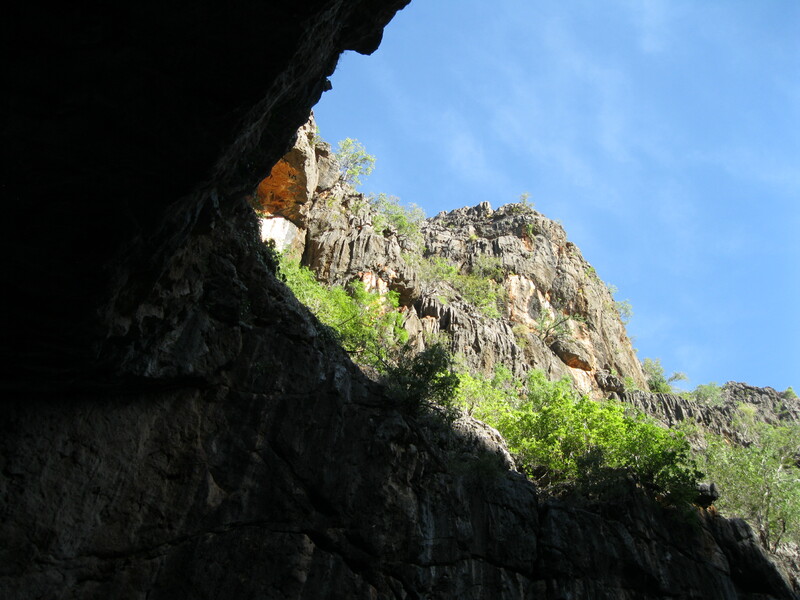 Tunnel Creek is a part of an extensive fossilised barrier reef from the Devonian times 360 million years ago. It flows through a tunnel eroded by water beneath the limestone of the Napier Range and is the oldest cave system of Western Australia. The Creek once flowed across a gorge at the top of the range. At the time the ground surface on both sides was much higher than today. Water drainage gradually enlarged fractures in the limestone and an underground course followed. The old course created a shallow valley on the top of the range. The tunnel follows a prominent joint or fault that has acted as a channel for groundwater flowing through the limestone. The water has carved its way through limestone leaving behind 750 metres (2,462 ft) of underground terrain from one side of the Napier Range to the other. During the dry season it is possible to walk from one entrance to the other among permanent pools of fresh water. The tunnel is 12 metres (39 ft) high and 15 metres (49 ft) wide. 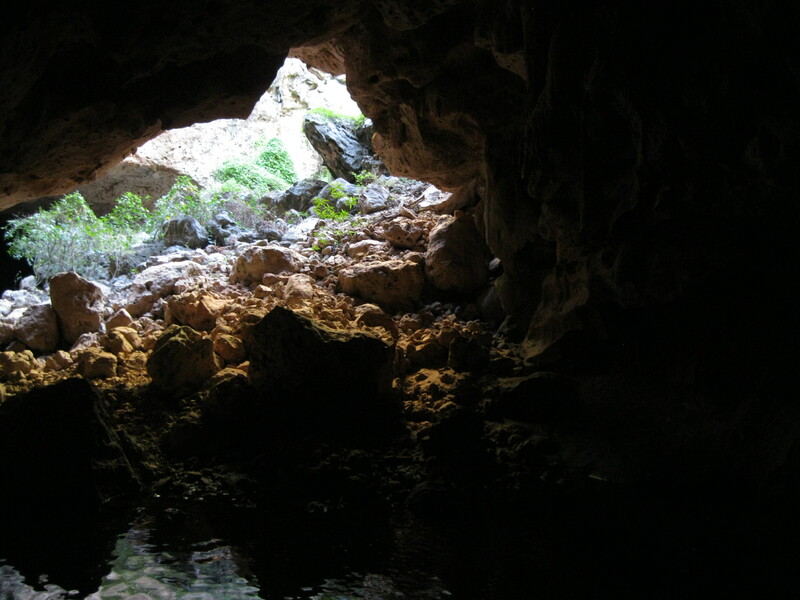 The presence of underground pools in the cave is due to the water table being based just below the current erosion surface. 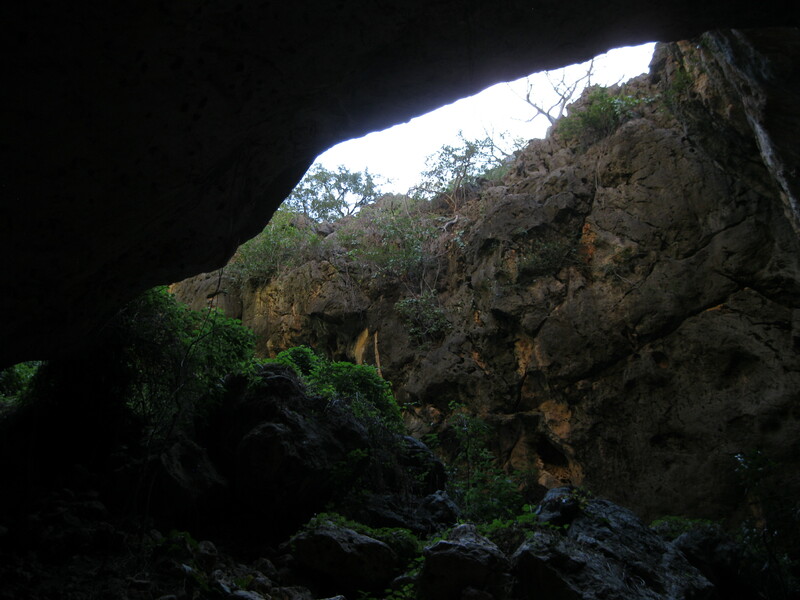 Water only flows through the cave after extended heavy rain during the wet season. 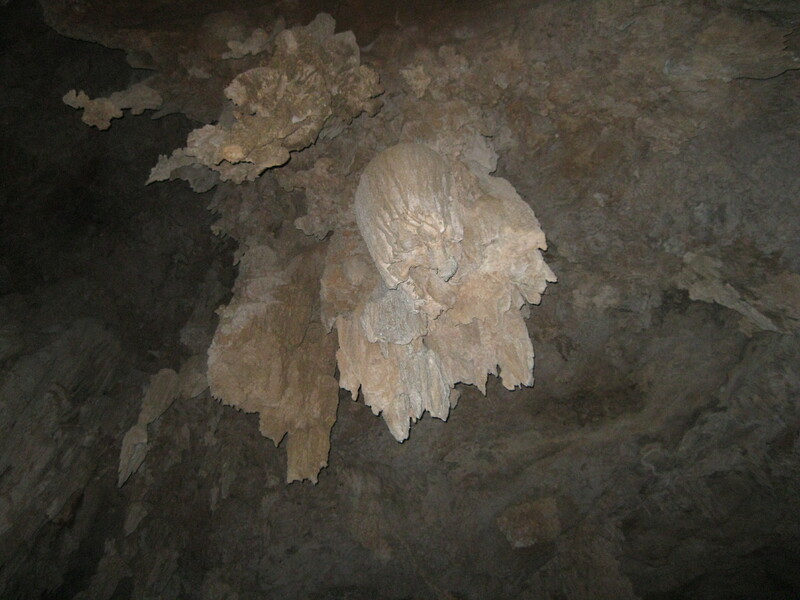 In the dry season, water drips from the roof of the cave to the ground which creates stalactites and stalagmites. Water flowing down the walls form flowstones. Over the years, as slightly acidic rainwater seeped through fractures in the fossilised limestone reef, the calcium carbonate dissolved, redeposited as small dripstones and opened up the limestone to form the cave. The dissolving of the limestone through chemical and physical erosion made the roof of the tunnel collapse through to the top of the range. This allows for the sunlight to enter the tunnel at this point. The sunlight only enters here and at the entrances. A bench 8 metres (26 ft) above the current floor marks the old underground creek level. 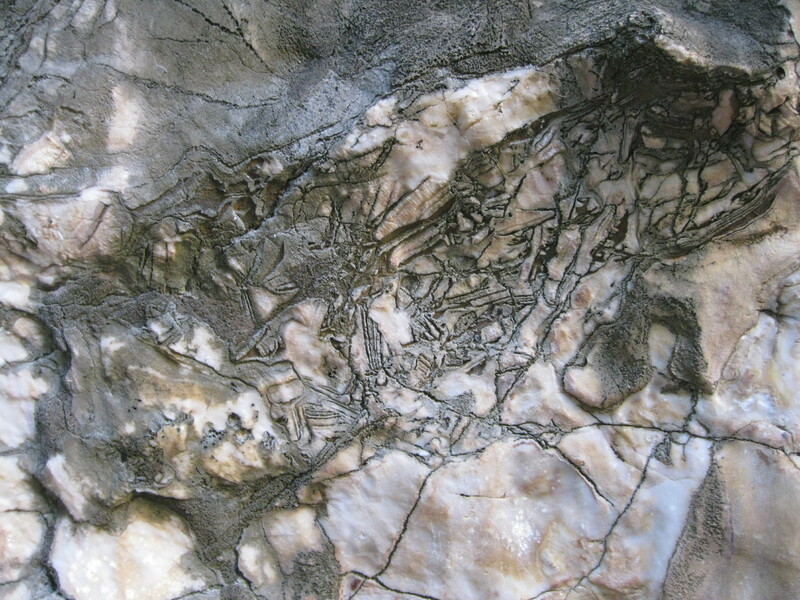 Cave systems have formed when the reef was exposed at the Earth’s surface. This first happened 250 million years ago and some of the present caves may have emerged at the time. They have rejuvenated over the past 20 million years as the reefs were disclosed. The Napier Range runs parallel to the King Leopold Range. 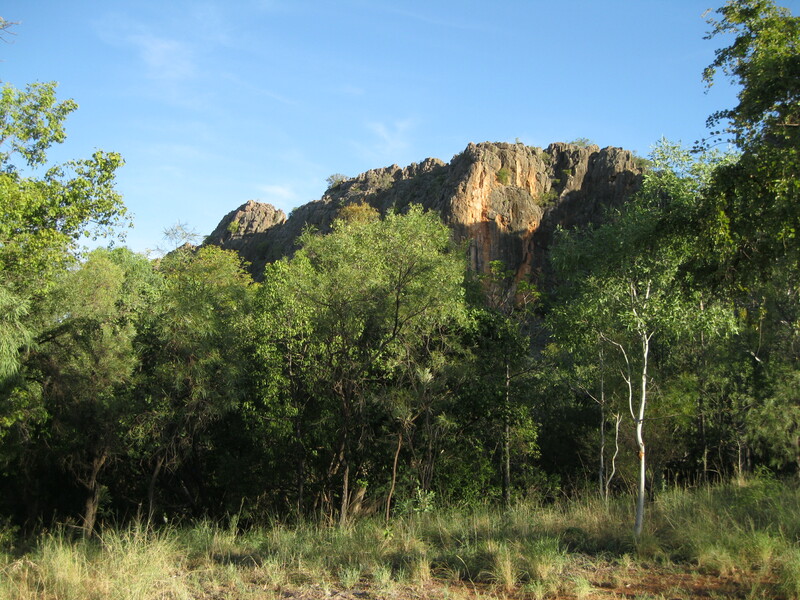 Unlike most of the Kimberley which is composed of sandstone, the Napier Range to a large degree consists of heavily eroded limestone or karst. 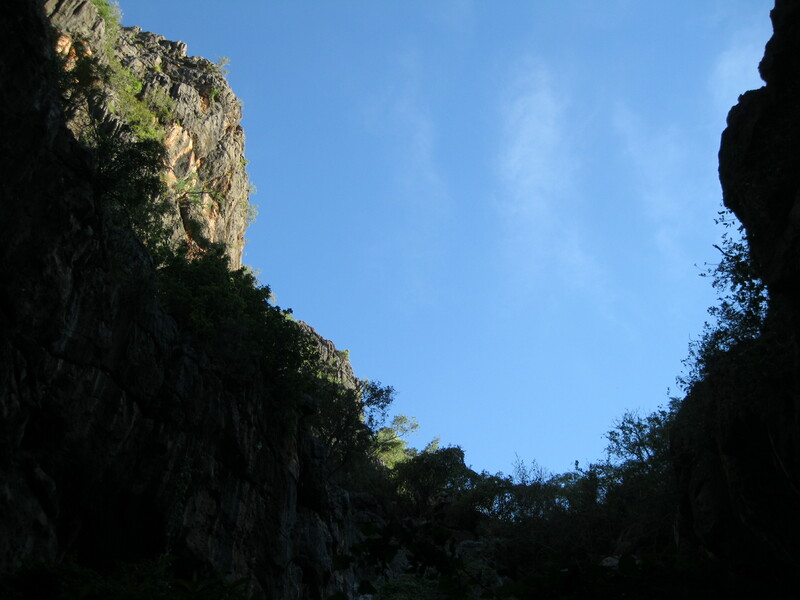 Besides Tunnel Creek, also Windjana Gorge and Geikie Gorge were all a part of the same limestone reef formed during Devonian times. The range is subject to intense seasonal rainfall and is covered by savanna vegetation. Small deposits of copper and lead have been discovered but there are no active mines in the area. The tunnel has a fascinating subterranean wildlife with freshwater crocodiles in the spring-fed pools. They feed off small fish, crustaceans, larger frogs, snakes and small mammals. Rainbow fish, Bony Bream, Spangled Perch and Fork-tailed Catfish inhabit the area which feed of the plentiful population of insects and aquatic invertebrates. If you light your torch close to the waters edge, you may attract a freshwater crustacean known as Cherubin. They feed off scraps left from other aquatic creatures but they have to be careful as other inhabitants of the waters may feast on them. Frogs are also common here and close to the water. You may see them entering the tunnel were the roof has collapsed going for the insects attracted by the sunlight. Little Red Fruit Bats may be found at the collapsed roof as this is a protected retreat until dusk where they depart for the woodlands to seek out blossoms on the trees. The tunnel was once known as the “Cave of Bats”. At least five species of bats are known to use the tunnel. This includes the Yellow-lipped Bat which is only found in the Kimberley and the Common Bent-wing Bat that huddle together in the roof crevices for warmth and security. The Orange Horseshoe Bat, known for its horseshoe shaped nose, likes the limestone caves due to the warmth and humidity when resting. They do not group with their own kind. Another inhabitant is the rare Ghost Bat which is Australia’s only meat-eating bat. They prey on frogs, lizards, small birds and mammals and other bats. They require complete darkness during the day so bear that in mind when using your torch. The best time to visit is from May to September in the dry season. The park is generally inaccessible during the wet season. 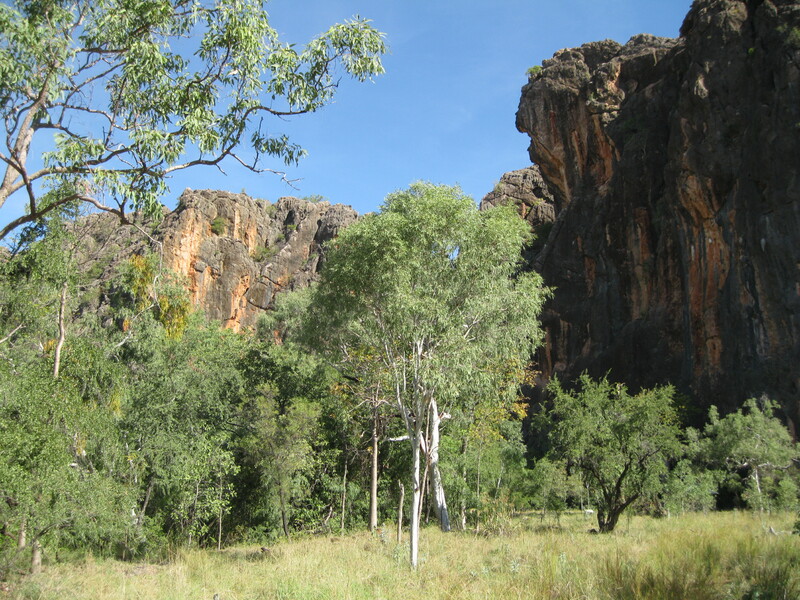 Camping facilities are not available at the Tunnel Creek but at Windjana Gorge National Park. 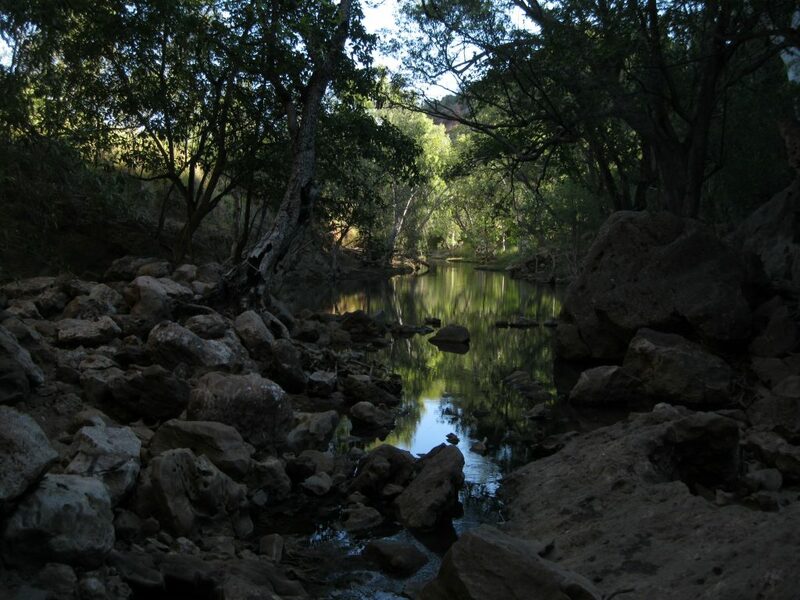 An option could be the head into the Windjana Gorge camping ground first to set up camp. When all is settled, make your way down Fairfield-Leopold Downs Road which will lead you straight down to Tunnel Creek National Park to the south. To travel around this park of the Kimberley and the park you need a 4WD as the only access is via unsealed roads. Tunnel Creek is appropriate for day visits. Access is limited to toilets, picnic tables and information kiosks. There are no rubbish bin, so make sure to bring any waste back with you. Upon arrival at the part you will be approached by a massive stunning rock wall. The carpark is based close to the trail where you can park your vehicle and head down to the trail. Exploring the tunnel is quite the experience as you will be heading into an underground creek with fascinating wildlife and rock formations. It will be like entering an amazing world like nowhere else. You can easily spend a couple of hours exploring the tunnel and the park as it is such an amazing place. There’s an option of doing an Aboriginal guided tour with an emphasis on the cultural significance to the local Bunaba people. This tour can give you a bit of interesting information but it is not all that informative. Aboriginals are generally timid and quite people. They are not very talkative and therefore the insight you will get to their culture, history and way of life on this tour is limited. This is a cultural thing and it’s just how most Aboriginals are. If you like to explore on your own you may as well do that. There are two walks you can do at Tunnel Creek. If you’re not interested or cannot access the tunnel itself you can simply do the Tunnel Entrance Walk which is a 200 metre (656 ft) return walk from the carpark. When making your way down towards the tunnel entrance you will be approaching the majestic massive rock walls. This is such a magnificent sight and one of the highlights of the park. You can get some amazing photos of the sheer rock walls of different shades of orange, red and grey fronted by the beautiful savanna vegetation. You can get cool shots from many different angles. 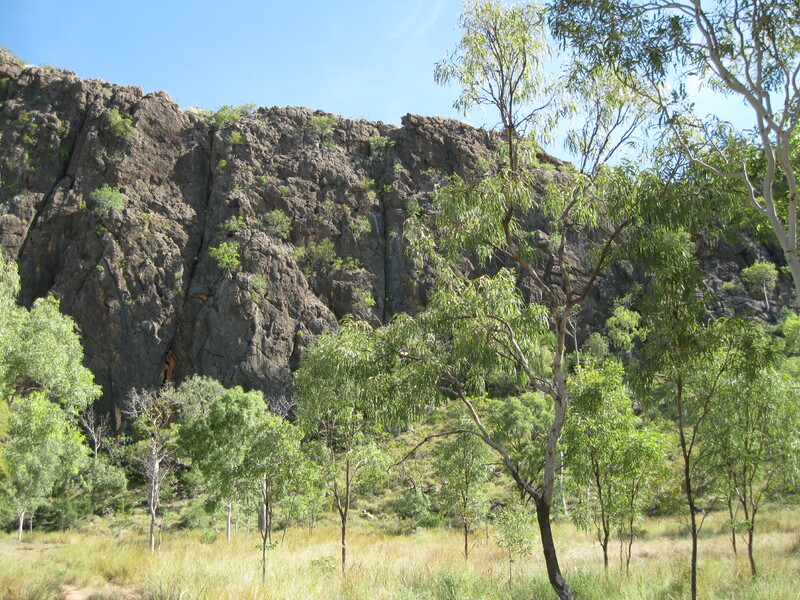 The scenery is similar to the one you will see at Windjana Gorge National Park but still different in its own right. The walk down to the entrance is an easy stroll that will take you to the place where complex patterns and textures in fractured limestone rocks are displayed on the creek bed. To head down into the tunnel you will be going on the Subterranean Trail which is a 1.7 km (1.1 miles) return walk. 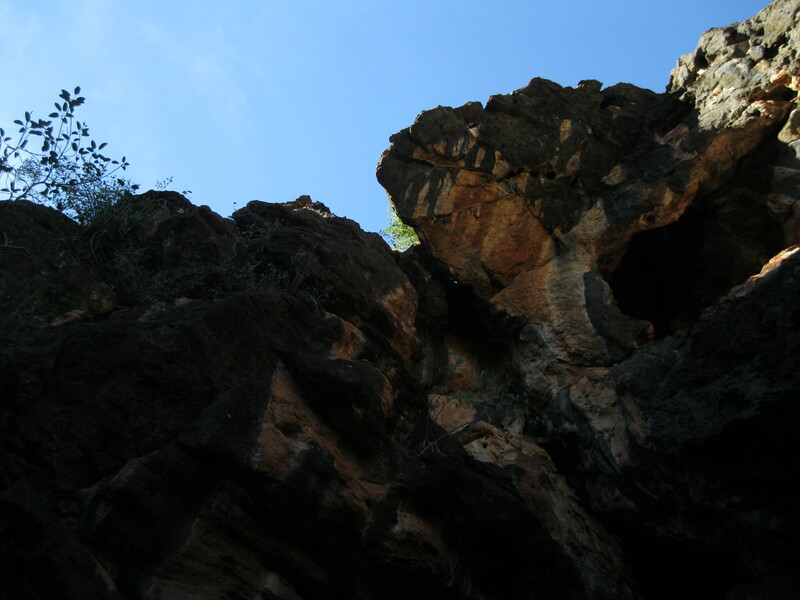 As you enter the tunnel from the entrance you have to climb down a rocky ledge. Bear in mind that you may get a bit wet on the way down. Be careful as it’s a bit of a challenge climbing down the rugged terrain. It’s recommended to bring some additional footwear you can change into as you will be walking through the creek in certain areas. It is essential that you bring a torch as it is pitch dark when heading through the tunnel. So mind your step. The hike will for the most part be on dry land along the creek. It is highly recommended that you do the hike through the tunnel on the Subterranean Trail as this is the highlight of the whole park. The trail goes through fascinating terrain of the eroded tunnel which is quite an otherworldly experience. Stay on the marked trails and bring plenty of drinking water as your water supply cannot be refilled on the trail. When you light the torch into the creek you may just see the reflection from the eyes of freshwater crocodile. Bear in mind that they are not territorial like estuarine crocodiles (saltwater crocodiles) and are not dangerous to humans. The collapsed tunnel roof is located near the centre of the tunnel, so half way through. This is a corridor to the outside world and to approach it you will have to cross the creek and head up a rugged terrain of rocks. This spot is so beautiful with views of the steep rock walls and savanna terrain beyond the tunnel. As you continue onwards through the cave of magnificent scenery you will reach the end of the tunnel where the creek continues beyond the cave. 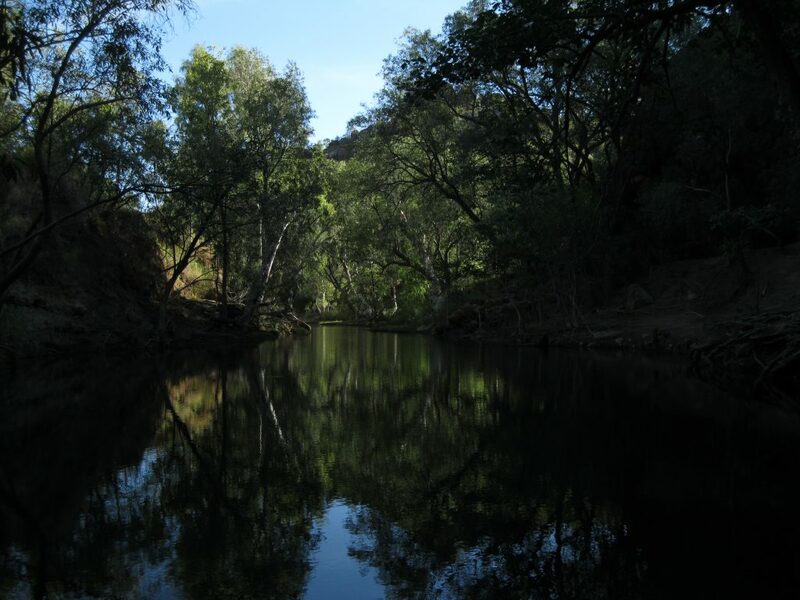 This is a marvellous sight of a beautiful flat creek with surrounding vegetation. This is a perfect photo opportunity. You can get a good shot of the creek and the vegetation or of the cascades leading down through the rocks, towards the tunnel, with the creek and vegetation as the backdrop. You may be lucky and spot a bit of wildlife here. 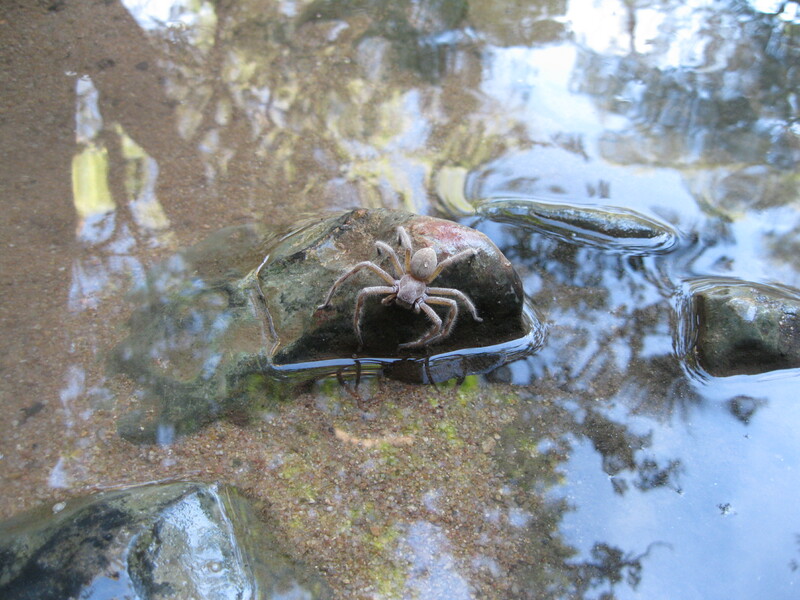 There may just be a spider resting on one of the rocks around the cascades. So keep your eyes open. Spend a bit of time here checking out the scenery and then return the same way back through the tunnel towards the carpark. The good thing about doing the same route in the opposite direction is that you may just spot features you didn’t see heading in. Jandamarra was a member of the Bunaba tribe and a fugitive whom they believed to have had supernatural powers at the time. The legend of Jandamarra is a fascinating story and is described thoroughly in our article on Windjana Gorge National Park. He was on the run and spent nearly three years hiding from the police at Tunnel Creek. He was killed in 1897 during a gun battle with an Aboriginal police trackers opposite the Tunnel entrance. Therefore the tunnel holds a lot of historical significance to the local Bunaba people as well.